Below you can skim through a list of our most commonly-asked questions that cannot be easily answered elsewhere on our website. Additionally you are welcome to use the contact form immediately below to submit your a question. We will not only answer it ASAP, but we also may paraphrase it and add to the list below if seems like it might help others. Which experience is better, Small Private or Public Telescope tours? Our private observatory does house the largest of our BIG telescopes, the awesome TPV, but our public observatory has the rest of our BIG telescopes and the best audio-visual equipment. Some worry that differing levels of astronomy literacy might cause them to slow down or be slowed down by the rest of a public tour. Even in the extreme this is unlikely. If you are a PhD Astrophysicist we are going to show you the original pink-brown combo of photons from Pluto, and other things you've only seen as data or pictures, just as well in either format. Dumb questions? Of course they exist! But you can't utter one at the Dark Ranger Observatory, because we answer every questions as if it were the smartest one asked each night. It depends on how specific your astronomy needs are. Private tours are designed to cater to astrophotographers, telescope-test-drivers, and/or astronomy buffs seeking the maximum intellectual/educational immersion experience. Nevertheless some simply prefer to privately celebrate the unique experience of our amazing night sky. In contrast, our goal with public tours is to make these as social of gatherings as possible. To that end we strive for universal appeal by striking a balance between education and entertainment. Yeah, but which do the Dark Rangers prefer? Thanks for asking! Though we are the most knowledgeable astronomers and telescope techs you can hire for a night, we are first and foremost entertainers. Entertainers always prefer a 'big room.' So, if you want to see us at our best, because WE are having the most fun, book a public telescope tour. Wait! So Large Private Telescope Tours would be the best of both worlds? Is your observatory wheelchair accessible? Yes. Our accessible parking gets mobility impaired guests within 150 feet (50m) of everything: our telescopes, amphitheater/auditorium, and accessible porta-potty. Are pets allowed at the Dark Ranger Observatory? Our Great Dane has the run of the place, as he helps with security and literally keeps the coyotes at bay. However unless you specifically request to meet him while we are closing for the night, it's very unlikely you will see or even hear him when the observatory is "in show." Unfortunately your pets are ONLY welcome to remain in your car, in our parking lot (after having a brief bio-break in the brushy outskirts of our parking lot). Due to unknown but potential allergies or phobias of our other paying guest, your pet is not allowed at our Observatory itself. a) are being assisted by a service animal functioning in accordance with ADA rules and guidelines. b) have booked a private tour and alerted us that you will be bringing your well-behaved dog/cat. With prior approval we might also be interested in meeting your more exotic animal(s) as long as your horse, falcon, parrot, otter, bear, rhino, orangutan, etc. is unlikely to 'mark', climb on, or rub-up-against our telescopes or upset our wild Pronghorn, or be eaten by our wild coyotes, or owls. Is it true that you offer free hot drinks every night? Refills are also free while hot water lasts, but you should reuse the same cup. So as to encourage a conservation ethic, extra cups cost $10,000 and full payment must be made in cash. Is food available at the Dark Ranger Observatory? No. Indeed you are only allowed to consume your own food in your car, in our parking lot. In addition to protecting our telescopes from salty, sticky, or greasy hands, we have to keep the facility food-free. Because our observatory is located on the prairie-forest habitat interface, we can't risk crumbs or even food-odors attracting wild animals . Is smoking allowed at the Dark Ranger Observatory? Absolutely not! All smoking must be restricted to our parking lot. Even when it can be confirmed that smoking may not offend a single guest (say in the example of a private tour) we still prohibit it anywhere remotely near our telescopes as smoke readily damage the sensitive optics beyond the ability of even a professional cleaning to restore. Can we consume alcohol at the Dark Ranger Observatory? No, at this time we do not have even have a beer liquor license. This means we do not server alcohol AND you cannot even BYOB of your own alcohol on the premises including our parking lot, even if it is well disguised and discretely consumed. While it is not widely known, it is easy to confirm that Utah breweries, wineries, and even distilleries exist and produce truly excellent alcoholic products (and we are happy to recommend our favorites). It's just, for better or worse, the consumption of those products is strictly regulated everywhere in Utah. Exception: With prior approval and when consistent with Utah law pertaining to private events, those who book a private tours may supply their own alcohol (as long as it is free) at our private observatory, for a private event where there is an established guest list. Examples might include a business party, or a wedding. Wait! You do weddings? Can we be married by a Dark Ranger? Yes! We are not only happy to host receptions, Kevin "The Dark Ranger" Poe is licensed to officiate weddings in the State of Utah, and can be contracted to perform an inspirational, creative, but secular (non-religious) ceremony. Email or call for more information. Why is your competition so much more expensive? and c) pay our astronomers a living wage rather than relying on volunteers or interns. There are many other entities who offer stargazing with telescopes (and most are more expensive), but either their telescope(s) get setup in dark parking lots or less traveled road shoulders, or if they operate actual observatories, they are located in suburban or rural locations where light pollution significantly detracts. To the best of our knowledge, only we and the McDonald Observatory offer the best of both worlds. The other reason we don't like the term "competition" is because we are excited to see the recent rise in astronomy tourism as that can only lead to an increase in science literacy and a heightened awareness to the evils of light pollution. In particular we endorse the efforts of the few National Parks who offer stargazing programs, as only they prioritize that two part "mission" to the extent that we do. Besides, we the Dark Rangers, trained many of those park rangers, so of course we are going to promote their "free" (after the purchase of a park entrance fee) presentations. Compare what you do, to the stargazing Bryce Canyon National Park offers? To put it simply, we merely offer the deluxe version of a similar experience. They have the same near-pristine dark sky, only employ staff with excellent customer service skills, and champion science and night sky preservation the way we do. Where we differ, is that our telescopes are larger, our amphitheater and telescopes are only 42 feet (13m) apart so there's no commute with limited parking in between, and our staff is more experienced. The biggest difference is that because they don't cap attendance, they often get lines 50 people deep per telescopes, where we promise a 1:7 telescope per guest ratio. 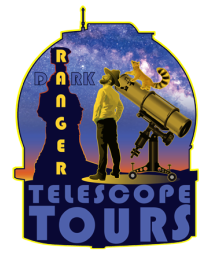 To be clear many of us Dark Ranger perfected our skills in the service of Bryce Canyon (as paid staff and volunteers) so we are eager to donate our time and expertise to help them with telescope repair and maintenance and when we are sold out , we unequivocally direct our overflow to them. They reciprocate by sending guests to us (though you might have to specifically ask) on their off nights since we are open 7-nights per week and they can only do astronomy 2-3 nights per week. Is it true that child-eyes can't focus well enough to use telescopes? No! Indeed exactly opposite is true. Humans have the best night-vision at age 11-12 because only they can dilate their pupils to a maximum of 10mm. Furthermore, younger eyes have a greater range of focus (due to more flexible lenses) so they seldom need to adjust a telescope's focus to match their vision. As long as a child has had a few minutes of practice looking through a tube with one eye closed (or manually held closed), they will need less time at an eyepiece than adults to get the best possible view. We can only speculate that some of our so-called competition created this myth to excuse themselves from the responsibility of hiring staff who are (or training them to become) good with kids. Please note our family-friendly pricing. Hopefully that says everything else we cannot politely articulate here. Why don't you offer Senior or Military discounts? We respect our elders and support our troops to the extent of offering free astral navigation workshops that should, but as a routine are NOT being taught in the U.S. Military. However our discounts are determined based on our estimation of ability to pay, and getting the most science literacy / light pollution awareness "paid forward" per our discount dollar. We know that all young families (including those in the military) struggle to make ends meet. We also think that it is their children and not their grandparents, who are more likely to become the astronauts, engineers, and planetologist who will takes humanity to Mars and Venus while keeping Earth as livable as possible. Lots of places brag about their dark sky. Can you prove yours is darkest? However, thanks to exhaustive and peer-reviewed research of the sadly no longer funded, NPS "Night Sky Team" you too, can prove that the 4 darkest places in North America, that are still accessible by a paved road, all occur in Southern Utah. In these locations you can see 7,500 stars over the course of a dark night.